I started a shelf layout over the winter in my apartment. It's two modular pieces, one is 21"x 72, the other is 18"x 72". 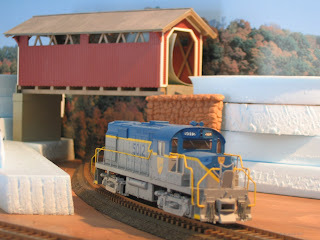 I am using MRC's DCC Express to run it. 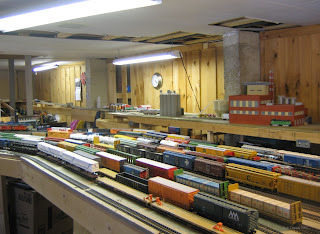 The basic concept was taken from Mike Confalcone's Hardwick & Woodbury from Model Railroad Planning 2007. 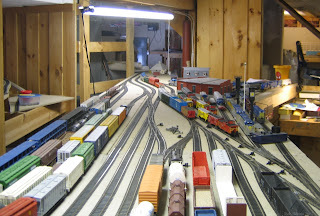 I have a main, a passing siding, two industries to switch, a engine house and a branch line, in this small space. I can always use this layout in a larger home layout when it is finished. 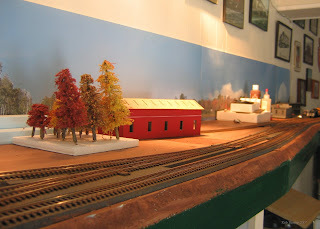 The layout concept is northern Vermont in the Fall of the late 1980's. My short line Central Terminal, interchanges with the Boston & Maine, CP Rail and Maine Central in St Johnsbury, VT.
North end D&H yard / west end B&M yard. 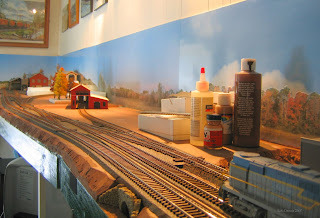 The B&M yard consists of 5 tracks (from the left) where the D&H mainline then splits the yards with WY Cabin in the center of the picture. On the D&H side is 10 yard tracks total with the engine terminal and wye in the rear right. The mainline ends just beyond the 's' curve at present but will eventually go into a helix and then split at QG to go into both D&H and B&M staging. This is the recently completed (track work) north end of the Southern Adirondack. Bottom right is my uncovered covered bridge and the future Towle & Son Sand and Gravel siding to go in to the right. The Saratoga Lake public delivery track comes off to the left. The curve will someday see a short version of the trestle that crossed the north end of Saratoga Lake. 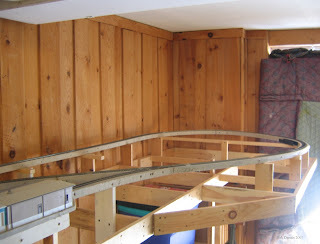 The bridge across the door is removable and connects to Saratoga yard. The SAR engine house is seen to the left. Looking across the yards at Mechanicville, the Round Lake Paper Co. Mill 3 is seen at the south end of the SAR with Lamora Cement just across the street. 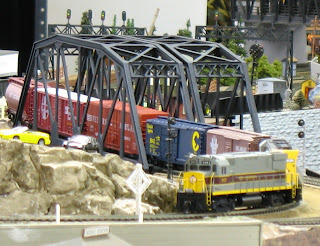 R A Dennis Lumber & Supply is just beyond the double track thru truss bridge then comes my scratch built B&M prototype 'uncovered covered bridge' and the hill toward Saratoga. This is the start of the Colonie Mainline, BK will be just to the left on the track to the rear. The tight curve was necessary so I could have a decent sized crew room and get the trains through. The scene will be of the 'big fill' in Waterford including the old barge canal at MP A11 and the overhead road bridge just to the south. Washington Ave crossing will be at the switch to Prime Mfg. seen at lower left. Looking south on the Colonie Main, Mohawk Paper run around, stub, and industry lead. Saratoga & Spring streets will converge just as the industry lead curves toward the building (cars spotted) while including the signals that still protect the prototype crossing today. 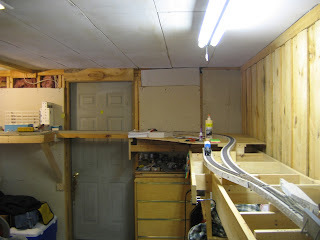 The Main curves to the left and Norlite siding will come off the main just before the tracks cross the aisle (another removable bridge) and go over the washer and dryer to reach Colonie. 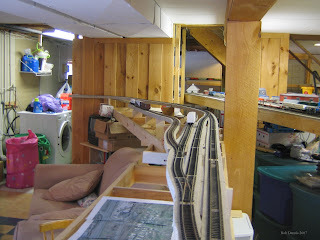 Randy Epstein sent along a few photos of his new bridge project on his layout. These bridges are much more prototypical and detailed than the old bridges he had in there, great job Randy! "Inspired by a prototype Northumberland, Pennsylvania, this NEW 18" Through Truss Bridge is the first truly American 18" bridge offered by Atlas. The HO Through Truss Bridge features simple, snap-together construction and specially designed bridge track. 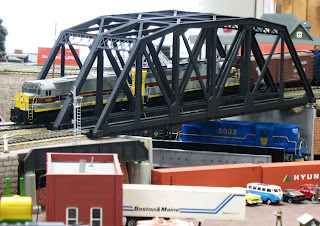 With two different colors to choose from for both Code 83 and Code 100 layouts, this bridge is perfect for any modeler." From Atlas website, comes in code 83 & 100, black and silver, retails for $24 and JP's Trains & Hobbies in Latham has them in stock. Great looking bridges.....Randy should do Atlas ads, lol.